Starwood Hotels & Resorts Worldwide, Inc. announced that it has closed on the sale of Hotel Imperial Vienna, a Luxury Collection Hotel, to Al Habtoor Investment - the investment arm of UAE conglomerate Al Habtoor Group for 71 million euros. As part of the transaction, all rooms and suites of the iconic hotel will be renovated over the next four years. 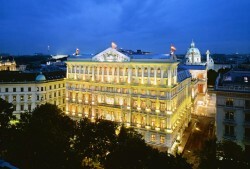 Hotel Imperial will continue to operate as part of The Luxury Collection brand under a new long-term management agreement.